A new edition of a book co-authored by Professor Christopher Davis has been published by Cambridge University Press. 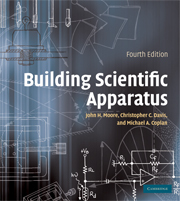 The book, titled "Building Scientific Apparatus," was originally published in 1983, and was co-authored by Davis, John H. Moore, and Michael A. Caplan. Now in its fourth edition, the book has been described as a practical guide to the design and construction of scientific apparatus, or laboratory instruments, serving as essential reading for scientists and students of engineering, as well as physical, chemical, and biological sciences. Simply put, the book teaches scientists and engineers how to perform experiments. Included in the new edition are features on the physical principles governing the operation of the mechanical, optical and electronic parts of an instrument, new sections on detectors, low-temperature measurements, and high-pressure apparatus, as well as 400 new hand-drawn figures and tables. The book "will continue to serve as a bookshelf standard in laboratories around the world," according to Jason Hafner of Rice University.